Tiberius Julius Rhescuporis V was a prince and Roman Client King of the Bosporan Kingdom. He was the son and heir to the Bosporan King Ininthimeus and his mother was an unnamed woman and was of Greek, Iranian and Roman ancestry. He was a contemporary to the rule of the Roman Emperors Gordian III, Philip the Arab, Decius and the period Crisis of the Third Century which occurred in the Roman Empire. Little is known of the reign and life of Rhescuporis. 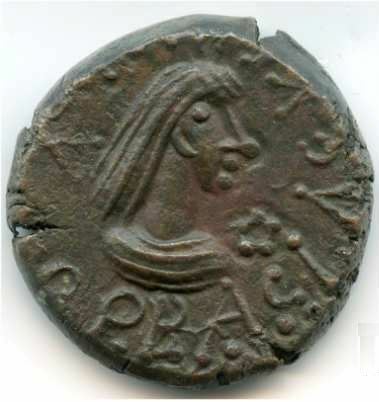 According to surviving coinage, Rhescuporis V appeared to have been a religious person who was involved in the worship of the Goddess Aphrodite and her cult. During his reign, Rhescuporis V co-ruled with his three sons from an unnamed woman: Pharsanzes, Synges, and Teiranes. He was eventually succeeded by his third son, Teiranes.